For point based games, use the x01 keypad. Ideal for Count-Up and practice routines that have ascending scores. Change the default start score of “0” by tapping the players score in the header. For target based games, the center game column will list the target for each round. Like Cricket, tap the target/round to record the number of dart hits. Enable Special Targets to add bulls eyes or other targets, as needed. Halve-It games are target games that penalize players who miss by reducing their current score by half. Increase the challenge by enabling special targets. Each target/round is worth 1 point per “hit”, treating all target rounds equally. Each target/round is worth it’s corresponding value for each “hit”. Ideal for progressive or variable scoring games. Insert Bulls, Doubles, Triples, 3B, etc. Tap the DC Logo to access your complete match history. Matches listed here have not been completely uploaded to your membership account. Connect to the Internet to complete the process. Select Control the Match if your Guest is having connectivity issues and you wish to score this round for both opponents. Compete with fellow dart players online by entering the Connect Code provided by your host. A new match clears game history. Use playing with a group of players to track the number of games won by each. Use for formal competition between two sets of opponents. Players cannot be changed without starting a new Match. Use to compete against yourself or devise a practice routine. Use to load league game selections. Refresh the application in a WiFi environment to make sure you have all of your events. If you are missing an event, try checking in again (below). In this area you can quickly start a match with advanced settings; perfect for playing your friends in the pub! GET READY FOR LAS VEGAS! Beat the computer at the PDC Qualifier format! Adjust the opponent level as you progress. Check for league and program updates BEFORE matches. They may be using an email that is a different from the one associated with your DartConnect Account. Contact your league or go to the member site to update your profile. Use our League Look Up tool to see which email your league may be using. a League Match with DartConnect? Understand the importance of recording “Misses” and “Busts” – do you know how to “insert a miss” if someone forgets? Have you reviewed your league’s format, selecting the best User Settings? Experiment and go to FAQs on the member site to learn more. Keep it simple. Many organizations, leagues and tournaments prohibit editing beyond the previous turn. Changes may affect the game score and opponent’s strategy for subsequent turns! Player email is required to submit player changes to the league. Enter First 3 Letters of First Name, SPACE, Last Name. Log in failed. Please try again. Password failed. Please try again. Want to save DartConnect to your home screen? Do NOT use the native web browser. Download Chrome and save DartConnect to your Home Screen. Use Apple Safari and save DartConnect to your Home Screen. To learn what other devices and browsers are compatible with DartConnect, visit our web site. Opponents play until one player wins the required number of legs. Also known as "First To" or "Race To". Opponents must play every leg, regardless of the result. Opponents are required to win the match by at least two legs. Option to determine a maximum number of legs. Opponents are required to play legs organized into sets. Winner is determined by the set record, not the number of legs won. For convenience, DartConnect lists the most common variations of the '01 game. However, players have the option of playing variations of "Count Down" with any number, for either player. Select "Other" from the standard game menu, select the '01 category and then tap either '01 score in the header to activate the edit process. A good starting place for new players. Choose your starting score and begin subtracting the total points scored by all three darts for each turn. To win the game, a player must score the exact score required to reach "0" points. Exceeding the points required, results in recording a "bust" and forfeiting the turn. The most popular option, games with this option require each side to end the game with an exact score that includes the final dart hitting a mathematically correct double target. If the exact score required to win is achieved without the final dart being a double, the turn is considered a bust, and should be recorded as such. Games with this option require each side to hit anywhere on the double ring (or double bull) before scoring can begin. The dart that connects with the double counts for the full value of that number (2 x value) and subsequent darts scored, count as well. Darts thrown prior to connecting with a double target do NOT count towards the score turn. Games with this feature require EACH participating player for each opposing group to hit anywhere on the double ring (or double bull) before they can begin contributing to the group's score. Different variations include: a side cannot win until all players have hit a starting double, which could also be the finishing double; allowing any player who has hit a starting double to also score the winning double without his partner(s) having hit a starting double. Activate this option to display mathematical hints to help you master the most common '01 outs. Before each turn, the score box will display the points required to set up for the Double 20 (40), Double 16 (32) or Double 12 (24). Standard cricket involves hitting each of the cricket target numbers at least three times, before your opponent does, while finishing with as many, or more, points than he does. This is the DartConnect default. A faster version of Standard Cricket that transforms the game into a race to close the targets, without tracking points. The score area will reflect the number of Marks (Hits, Counts, etc.) scored, as opposed to the traditional points scored. Operates identically to standard cricket, but substitutes the target numbers 10 - 5, for the standard targets of 20 - 15. Point values for each target number are adjusted accordingly. Note: When playing this variation along with points and bullseye as a target, the single (outer) bull counts for 15 points (25 minus 10). The double (inner) bull is twice the single, or 30 points. A variation of No Point Cricket, with a twist. All target numbers must be closed in order, and a player cannot advance to the next number, unless he has closed the number in the prior turn. If a player closes a number, and still has darts remaining, he must continue to score on the existing number, in an attempt to maximize his Mark total. This option is included for players who want to develop their own special cricket rules, but would like to keep that statistics associated with their variation, separate from the other cricket games. Similar to No Point Cricket with extended targets, however the targets must be closed in order. In Standard Cricket, darts landing on open numbers, but were not the intended target, count towards a player's score. When playing "Call", only intentional darts count. Players can announce the intended target before each dart, or play on the honor system. This option simply eliminates the bullseye as a required target. Consider this option for new players or when time is short. When playing organized league play, DartConnect assumes 1 Set = 1 Point. If your league uses a variable point system, correct it here. The score of the match will be displayed in the match recap and the subject line of the email. If your league is a partner league, it will also be displayed in the weekly league report. Unfinished games can be deleted at any time, allowing users to start a new game or End and Save the match. An unfinished game can be saved as part of the match, by selecting a winner. A winner can be determined using the current game score, randomly or with sudden death competition such as the higher score in the next round or Shooting for Bull. Ideal for leagues that have round/turn limits for certain games. Use Game Notes to document details. Description will appear in the Match Recap. Record a set-win when a forfeit, incompatible game or other circumstance occurs. This allows the match recap to accurately reflect the match events. Select which opponent receives the set win, or Both if neither opponent can supply sufficient players to conduct the competition. If there is a non-traditional game or other circumstance that DartConnect cannot currently accommodate, conduct the competition using a standard scoreboard and record the resulting win using this option. Add Match Notes to explain the situation and add game statistics if desired. Notes will be detailed on the match recap. Please let DartConnect know of any limitations, so we can determine the feasibility of adding additional features. DartConnect automatically accommodates when one side cannot provide a full roster for a given set. Simply select the players who are present for each side, and DartConnect will insert a missed turn for the missing player, always assuming the missing player goes after the present players have thrown. This preserves the individual stats for the participating players. Connect features require a Premium Membership and perform best when all parties have a quality Internet connection. You can monitor a device's ability to reach the DartConnect server with the green/yellow/red bar below the DCTV code in the red control bar. It is not unusual for connectivity to fluctuate, especially in public shared WiFi hotspots. This option allows others to follow your match, turn by turn. Once activated, DC will provide you with a TV Connect Code that you can share with others. You can share this code via email (device mail client required) or copy and paste the code for posting in email and social media. Spectators go to dartconnect.com, click on the DCTV logo and enter the Connect Code. DC League and Tournament Partners have their matches automatically listed with DCTV, on their corresponding channel page. If a player would prefer not to have their channel publicly listed, use the Connect Menu to end the broadcast. Premium members can compete with other members and registered DartConnect Guests by hosting a match. Select this option and DCTV will generate a code to share with your opponent. The guest opponent selects "Guest Connect" (located on the main menu) to enter the Connect Code. Important: As the host, you must make sure to set up the match with your player record set up on the left side (host side) of the match. This allows you to maintain control of the match, should the need arise. Should Internet connectivity interfere with online play, the Host can score for the guest player by tapping the turn indicator (located above the "Back" button) and selecting "host scores this turn" for the opponent's turn. To learn more about online play, visit the member's site. When competing against DartConnect, select the level of difficulty using the corresponding three-dart average as a guide. Once a match has been initiated, you can adjust the difficulty by tapping the opponent name ("DC 5.0") in the header. This allows DartConnect to adjust its level of difficulty between games, adapting to your level of play. DartConnect will index in small increments until it finds equilibrium with your current proficiency. DartConnect was designed to simulate real match play, allowing the player to return to the throw line and "watch" DartConnect's turn. If you want to speed up game play, select this option. Note: Players will lose their "grace period" for correcting miss-keys, requiring them to edit prior turns AFTER DartConnect finishes. This allows DartConnect to automatically start the next game, without any input from the player. The match will stop at the end of each set, with Auto Start resuming with the next. Prevents the match recap from being delivered via email. The recap is still available in the members match log. If you would like to add a report header to the DartConnect Recap reports, enter it here. For headers that repeat, or undergo minor changes from week to week, save the description as a template, and re-use as needed. This provides a complete screen overlay message when the device is idle in between games. It is dismissed with a simple tap to the screen. Use preview to experiment with the 3 different text treatments. Any of the fields can remain blank. Use "Preview" to optimize formatting. You must select "Active" for the screen saver to display after a period of inactivity. Reactivate at any time to provide new players an introduction to DartConnect. DartConnect will recognize exceptional accomplishments with a silent pop-up. 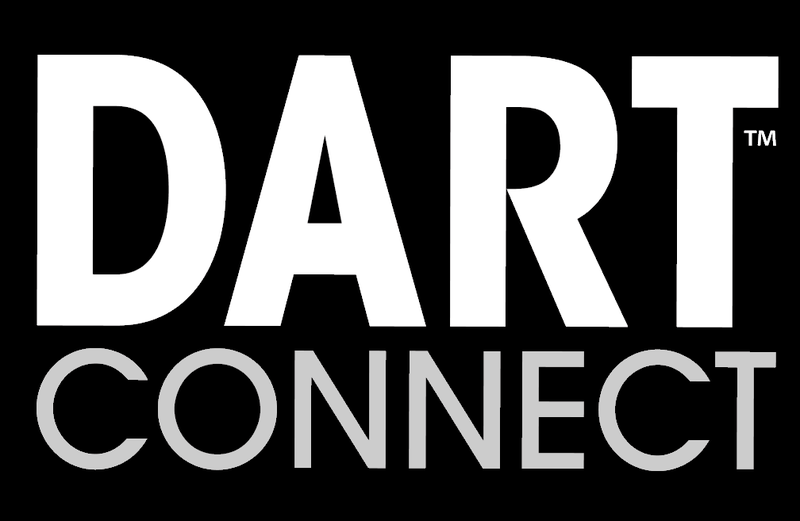 DartConnect will display players three dart average as the game progresses. DartConnect has added optional features to the game of cricket to speed game play and improve scorekeeper accuracy. These include: Dimming target numbers after they are retired by both opponents, detailing the point difference between the players and translating points into the number of bulls required to win the game. Also known as "hot" or "speed" keys, these common scores are provided to speed score entry with a single touch. The Pro Option is for experienced players who focus primarily on the 20 target. Optional suggested outs can be displayed on screen in either the traditional alpha-target format or straight numeric listing. The required out can be updated after one or two darts by recording the score of the turn so far, followed by the "+" key. For a more discrete experience, utilize a second device to broadcast the match on DCTV (through the Connect option) and activate "Show Suggested Outs" in the user settings (gear). This will display your outs on this device without it appearing on the main scoring device. Use this option with smaller tablets and smart phones, to enlarge the scoring keys. Note: In '01, this will hide the quick keys. Enables the scorekeeper to control when the score is updated. Ideal when using one device to enter the score, while another device is the scoreboard (using DCTV). Experiment with this arrangement before scoring a live match. Provided for the unlikely situation where an unreliable Wi-Fi could interfere with the application. This is the functional equivalent of putting your device in the "airplane" state. Note: Connect Features are not available when this is active. Match data and recaps will not be uploaded until the device connects to the Internet. DartConnect allows users to segregate players into two areas: The active roster area, where opponents are selected for each game, and the player/team library where all players and teams can be managed. This allows the user to have a short list of eligible players for the current match. Maintain your complete list of players. The library allows you to develop a large group of players without having to display all of them in the match roster area, where opponents for each game are selected. To select players eligible for the current match, use "Reset" and select the eligible players. To add or edit existing players, select "New" and "Edit" respectively. Deleting players is permanent - there is not a recovery process, once the modified library has been backed up. DartConnect allows you to back up your player library to your membership account in the event your device breaks or is lost. We recommend you back up your library anytime you make changes - the system will prompt you if it appears you have made changes. If using a second device, be careful of which library version you are downloading. It is a complete replacement, not a synchronization. Use to pre-determine the number of games/legs for a set. This menu will appear before each new set, unless the Advanced Menu is utilized. DartConnect allows you to customize match segments or even an entire match. All match setting adjustments are made on a go-forward basis. This allows the player to abandon a match setting (Options) after each game or adjust it during Match Set Up and Selecting Opponents. Ideal for organized league play. This is for the following set only. Subsequent sets will be prompted with the Legs Menu. This suppresses the Legs Menu for subsequent sets for all sets going forward. Player starting option is limited to exchanging the start, regardless of who wins the prior game. Player start rotation is based on the player who starts the first game/leg of the first set. The players will then rotate the start of the following sets. Game start will rotate based on the player who started the set. When Alternating Set & Leg Starts is selected, players have the option of allowing the start of the match and/or the tie-breaker game (the maximum number of legs possible), to be determined by Shooting for the Bull. Player starting option requires Shooting for Bull before every game/leg. A MATCH is typically between two opponents. The opponents may be 2 players, 2 double/triple pairings, or between 2 teams with separate rosters. A MATCH is made up of SETS, which contains GAMES, also known as LEGS. A match between 2 opponents/teams typically lasts multiple sets, so do not END & Save the MATCH until the competition for the entire event or league competition is complete. A new set automatically occurs anytime there is a change to the player line up. Recommended for new players and/or match environments that include players and score keepers who are unfamiliar with DartConnect. Use when the same players are competing in the next game/leg. If this is erroneously selected, you can always change player line up by selecting Match Set Up from the Game Menu. Use to access the Select Opponents screen. Use when playing multi-set matches. Recommend for experienced players who want to accelerate game play. Cork - Winner of the Bull Shoot starts. Mugs Away - The loser of the current game starts. Alternate - Start rotates between opponents. Game - Switch game type. Players - Switch players, then select game and set options. Cork First - Shoot for Bull, then confirm game. Allows Premium Members to access the Connect Menu between games. Enables the user to activate the screen saver between games. The screen saver must be active (Options Menu in Select Opponents Screen). Review your immediate game performance. Shortcut: Tap the white Game Three-Dart average at the bottom of the screen. Access the completed games match standing with this option. Shortcut: Tap the Match Three-Dart Average at the bottom of the screen. Players have a two-minute grace period to edit or resume the most recent game. Players can add notes regarding a particular game or the entire match. Examples include incorrect scoring, player throw order, forfeit information, etc. Notes can also be used to record extraordinary circumstances that affected the game or match. Notes are displayed in the match recap. Use this option to extend a match or reset settings made in the Match Settings Menu. Re-access Match Settings in Match Set Up for changes "going forward". After each match, select End & Save. 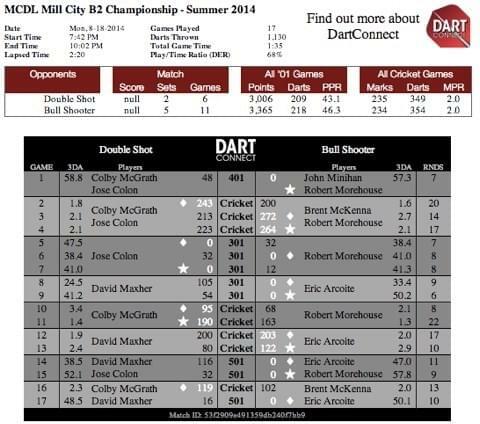 This tells DartConnect to close out your match, generate a match recap for all participants and update the member's statistics with game data. You can check the History option on the Welcome Menu to confirm the save process is complete. what the opponent has closed. individual target taps per turn. Every player with an email address receives a match recap. Member’s will also have their games posted to their online accounts. A white flight next to a player’s name confirms they are CONNECTED. Mark player as “temporary” to remove them from this device after the current match. Which dart thrown was the winning dart? What you observed and why you think it's a bug. What actions were taken to create the situation. Here are some hints on how to capture screenshots. [Alt]-[Prt Sc] (Alt-Print Screen). Open the email and paste - [Ctrl]-[V] - the resulting image.